The Bahujan Samaj Party (BSP) today got a shot in the arm with the entry of Munna Singh Chauhan, a former Bharatiya Janata Party (BJP) legislator from Vikasnagar, into its fold. Munna has been declared as the BSP candidate from Tehri Garhwal, much to the discomfort of Congress as well as BJP. Munna Singh Chauhan was inducted into the Bahujan Samaj Party at an impressive function here today. Immediately after, the party announced that he was its candidate for the Tehri parliamentary constituency. The development assumes significance in the wake of the fact that Tehri will now witness a triangular contest. Munna Singh had recently resigned from the assembly as well as the BJP. A high-level meeting was held here last evening at Kumhar dharamshala between BJP state and district leaders, which was presided over by national general secretary (organization) Ram Lal. Apart from district legislators, all district executives were present on the occasion and were guided on how to campaign in the constituency. Apna Dal, a political party working for the uplift of deprived sections, today announced names of their candidates for two seats for the forthcoming Lok Sabha polls. After BSP leader Ram Singh Saini jumped into the Congress bandwagon recently, rumours were rife that another senior leader of the party (BSP), Qazi Mohin-ud-din would follow in his footsteps. However, dispelling all rumours, his son Nizam-ud-din, who is the BSP MLA from the area, said the news was being spread because of vested interests. 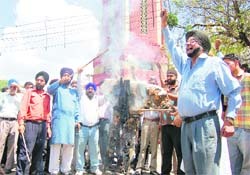 Akali activists in large numbers today burnt the effigy of the Congress leaders Sajjan Kumar and Jagdish Tytler at Clock Tower here. The protesters were expressing their resentment against the CBI’s clean chit to Tytler. Dalanwala police booked students of DAV PG College, after two groups clashed on the college premises, here this morning. Some of the students were injured in the clash. According to information, the clash took place between supporters of DAV PG College general secretary Parag Bhatt, of Aryan Group, and the one led by Rahul Rawat of ABVP. Parents of schoolchildren in some schools in the city are up in arms against the fee hike by the authorities. At Himalayan Public School in Kargi near here, around 300 parents protested against the fee hike and demanded greater transparency in the working of the school administration. The Uttarakhand State Information Commission today slapped a fine of Rs 25,000 on under secretary, general administration, in a case linked to Dixit Commission report. The auditorium of Wyneberg Allen School, which was gutted on March 30, was not insured. This has caused heavy financial loss to the school. In fact, the entire school building, which is estimated to cost more than Rs 50 crore, is not insured. Proving that learning never ends in life, 64-year-old Ganga Devi from Banjari farm at Khatima village of Kumaon region recently appeared for A-level examination for the open board. Uttarakhand has won the T20 Gold Cup at Matawalabagh here today. In the final, they defeated Orissa team by eight wickets. Batting first, Orissa team made a modest total of 100 runs in 11 overs. The opening pair of Irshad Khan and Baba Khan gave the team a good start scoring 19 runs and 14 runs respectively. Ladpur XI and Royal Club won their respective matches at Khalanga Cricket Tournament at Tapovan here today. 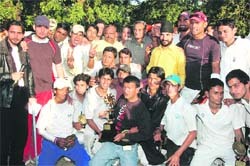 In the match between United XI and Ladpur XI team, Ladpur XI won the match by 38 runs. Batting first, Ladpur XI team had a bad start as they lost the first wicket at the score of five runs. The Badminton Association of India will organise the u-16 national badminton camp at Nainital from April 25 to 30. Uttarakhand State Badminton Association and Nainital Badminton Association have welcomed the development. Baroda Barons today defeated Kolkata Knights by a huge margin of 210 runs to reserve a berth in the semifinals at the second ONGC CMD Cup Cricket Tournament being played at the Abhimanyu Cricket Academy Grounds here. They will take on Assam Aragons in the first semifinal. His entry will not only make the contest triangular, but also give a boost to the Bahujan Samaj Party base in the hill areas. Earlier, BSP had its area of influence around Haridwar and Udham Singh Nagar districts. The party had seven legislators - five from Haridwar and two from Udham Singh Nagar districts in the first elected assembly in 2002. BSP improved its performance in the 2007 polls by bagging six assembly segments in Haridwar and two in Udham Singh Nagar district. However, the party did not taste any success in the hilly districts. Munna has earlier been Samajwadi Party legislator from Chakrata in Uttar Pradesh and also a member of the interim assembly formed in 2000. Later, he formed his Uttarakhand Janwadi Party but failed to win even a single seat in the first-ever elections to the state assembly held in February 2002. Before the second assembly elections in 2007, Munna Singh joined BJP and won from Vikasnagar assembly segment, which is part of Tehri Garhwal Lok Sabha seat. It is expected that Munna would now pocket a sizeable chunk of Scheduled Castes votes, in addition to those of Muslims, which would be a big dent to the Congress vote bank. And it is not only Vijay Bahuguna, Congress candidate from Tehri Garhwal, who would alone be affected. BJP’s Jaspal Rana would also feel the impact of Munna’s entry. Since both Munna Singh and Jaspal Rana belong to Jaunpur area of Chakrata tehsil of Dehradun, the votes from the area would now get divided between the two. Meanwhile, BSP, the third major political party in Uttarakhand, seems determined not only to expand its voter base but also to score its maiden victory in Haridwar. It is expected that the party will do well in both Haridwar and Nainital, since the candidates are not outsiders but party legislators. 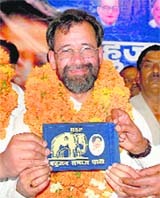 Amid slogans of “Uttarakhand ki shaan, Munna Singh Chauhan” and “Chado gundo ki chhati par, mohar lagegi haathi par”, Munna Singh was welcomed into the party fold by hundreds of BSP activists, senior leaders, including the party’s national general secretary and transport minister in the UP government, Ram Achal Rajbar, Uttarakhand BSP president Surajmal, Subhash Sharma and party MLA. Speaking to mediapersons, a beaming Munna Singh minced no words in criticising the BJP, calling it a party of “hypocrites”. “The BJP and Congress have signed a memorandum of understanding that each will take turns to rob it every five years. Fed up with their dirty politics, people now want change,” he thundered. Though Khanduri-bashing remained the focus of Munna Singh’s brief speech, he also launched a scathing attack on Bahuguna. “Bahuguna is a weekend tourist to Tehri. He never visits the 14 assembly segments that fall in the Tehri parliamentary constituency,” he claimed. On the comment by BJP spokesman Vishwas Dawar, terming him as “irrelevant”, Munna said since the past one month, Dawar had been “begging” him not to quit the BJP. BSP general secretary Rajbar and state BSP chief Surajmal said the party base in the state had witnessed a considerable increase in the past few years. Ram Lal issued clear-cut directions to senior leaders that the party and the Sangh (RSS) would settle for nothing less than a victory from here. BJP’s campaign incharge for the seat, cabinet minister Madan Kaushik, said party workers were united and would leave no stone unturned to ensure a victory. Meanwhile, a massive convention of party workers was held at Seva Samiti Hall today. State organisation general secretary Naresh Bansal, general secretary Ajay Bhatt, Madan Kaushik and BJP candidate Swami Yatendranand addressed the gathering. Mahila Mandal chief Sanjana Sharma said the party has been working for the benefit of farmers, workers, women and the service class, which will positively result in people voting for the BJP during the upcoming elections. From Pauri Garhwal, ex-state convener of Lok Jan Shakti Party Jai Krit Kadwal would contest, and from Tehri Garhwal, Apna Dal state secretary Sudesh Sharma Ishtwal would be the candidate. Addressing a press conference here today, Ishtwal said, “Since 1994, Apna Dal is fighting for the rights of the deprived section. We had put up candidates from 45 seats in Uttar Pradesh and will also contest all the five seats in Uttarakhand. Two names from the Garhwal region have been declared; rest of the three from the Kumaon region and Haridwar will be declared soon,” he said. In wake of the ensuing general election, the police has beefed up security near the Indian Military Academy (IMA) premises here. The Academy authorities are looking after security arrangements inside the IMA, but outside the police administration is doing the needful. Vehicles plying on the roads leading to the IMA are being thoroughly checked. Besides, an alert has also been sounded by the police administration. Although IMA authorities refused to divulge any details, IG (Garhwal) MA Ganapathy said security has been strengthened keeping in mind the ensuing Lok Sabha election. A verification drive is also being carried out in the villages near IMA. Polling in Uttarakhand will be held in the last phase on May 13. “My father (Qazi Mohin-ud-din) is very much with the BSP. A section of the media, besides some political foes are spreading these rumours due to vested interests. And this is not the first time that we are hearing such news. Last week, there were news that Qazi sahib and I had joined the Samajwadi Party,” he said. Nizam-ud-din added that a meeting was organised at their residence on Tuesday where all senior leaders chalked out the campaigning programme for BSP candidate Mohammad Shahzad. “Qazi sahib himself gave directions to all the leaders as well as party activists. He also discussed various issues related to polls with Shahzad and other leaders,” he said. Qazi Mohin-ud-din, a well-known leader, has earned a lot of respect due to the development works carried out by him in the area. He has won consecutive Assembly elections from 1974 to 1991 from Manglore seat. He also held portfolios of minister of forest, industrial development and jail minister in Uttar Pradesh government before shifting to Uttaranchal in 2002. Notably, Qazi was elected the first Protem Speaker of Uttaranchal Vidhan Sabha. Meanwhile, another party leader, on the condition of anonymity, said the rumours were the handiwork of some insiders. “You see internal politics is everywhere, in every party. As Qazi sahib has a strong base amid people of the area and also has a clean image, some party leaders could not digest this,” he said. “The rumour, aimed at maligning his image, is the result of internal rivalry,” he added. “The position of our party is very strong. With the issue of overall development, we will definitely win the elections,” said Nizam-ud-din. Addressing the gathering, the speakers accused the Central Bureau of Investigation (CBI) of being in the control of the Congress. They demanded that tickets given to Sajjan and Tytler for the general elections must be taken back immediately. Dalanwala police booked students of DAV PG College, after two groups clashed on the college premises, here this morning. Some of the students were injured in the clash. According to information, the clash took place between supporters of DAV PG College general secretary Parag Bhatt, of Aryan Group, and the one led by Rahul Rawat of ABVP. It is learnt that Rawat, whose election as president of the college was set aside by the Nainital High Court recently, and Parag Bhatt had old rivalry. Yesterday also supporters of both the groups entered into a scuffle but the situation was brought under control by the police. However, today morning the warring factions clashed inside the college, notwithstanding the police warning. Meanwhile, the police said a case under sections 307/323/504 of IPC has been registered against ABVP leaders, including Rahul Rawat and nine others, at Dalanwala Police Station. The Parag Bhatt group has also been booked under sections 323/504 of the IPC. No arrests have been made so far. Heavy police force has been deployed near the college premises. Apart from the increase in fees, they protested the hike in rate of books and school dress being sold inside the school premises. been demanding yearly admission fees and cultural fees in addition to the monthly fees. “Last year, we went to the authorities but no one bothered. As the students here belong to the lower middle class, it is impossible for parents to bear the brunt of such irrational wants,” said Alok Ghildiyal, an advocate, who is also a parent. School secretary Aditya Arya said, “We have accepted the demands of the parents. We are demanding only a 15 per cent increase in the tuition fee because of the salary hike of staff members under the Sixth Pay Commission and also because we have to maintain the school standard,” he said. Meanwhile, in Raja Ram Mohan Roy Academy, parents in large numbers gathered and protested against the school management over the increase in tuition and annual fees. Agitated parents shouted slogans and gave a charter of demands to the principal with an ultimatum to accept their demands by April 11. Roorkee: As many as 100 women gheraoed the Civil Lines police station in protest against the lethargic approach of the cops, here this morning. The group was demanding the arrest of two miscreants who allegedly injured a youth, Upender Kala, yesterday. “The police has been bribed the culprits - Raveen and Praveen. That’s why they are roaming scot-free,” alleged the protesters. However, following an assurance of prompt action by the SHO, the group agreed to end the protest. The Commission also directed that a compensation of Rs 50,000 be paid to Nadimmuddin, a lawyer from Kashipur, who had put up a query regarding Dixit Commission report. Both Public Information Officer and the Appellant Officer did not present themselves before the Commission. The matter came up with the Commission after Nadimuddin sought details of Dixit Commission linked to permanent capital of Uttarakhand. The Dixit commission was set up the state government nine years ago to give recommendations on the permanent capital of the state. The report of is with the state administration for the past eight months and has not been made public yet. Notably, this is for the second time that the Commission has levied a fine to the tune of Rs 25,000. Question marks are being raised on the efficiency of the school management to safeguard the interests of the school which is a registered society. According to Michael Sen, office incharge at Wyneberg Allen, the school property has not been insured and therefore, the school will have to bear the loss. “The property has not been insured but we have provisions in the school fund to cover the cost of damage,” he informed. However, the school authorities were tight-lipped about the extent of the damage. “We can only estimate the damage after the surveyor makes an inspection but we cannot divulge much at the moment,” Sen remarked. But sources place the extent of damage close to Rs 1 crore. According to reliable sources, the auditorium had special wooden flooring for indoor games which is very expensive. Moreover, it had been exquisitely furnished and also had the latest equipment and facilities. It, therefore, seems very strange that the authorities of Wyneberg Allen had chosen not to insure the school building and property. “About 7-8 years ago, we had given them a detailed proposal for an insurance cover of Rs 40 crore for the entire school premises at a cost of around Rs 2 lakh per year,” informed Anurag Gupta, development officer at the United India Insurance Company. According to Gupta, the school board had discussed the proposal and later rejected the same on the grounds that the school was not interested in spending so much money on insurance. It is definitely a case of being penny wise and pound foolish whereby in order to save on annual insurance premium, the school authorities have suffered a much greater financial damage. Moreover, since the school is a non-profit organisation and registered under the Societies Registration Act, 1860, serious questions are being raised about the role of the school administration in taking care of the assets of the society. A visibly irked Uttarakhandi said that all registered societies are accountable to the public for their actions as they are run with an interest of serving the public. He was angry that due to the carelessness of the school management, such a big loss has to be suffered. “Any property owned by a registered society is in a way public property as NGOs are meant to run for the benefit of the public. It is sad that due to the lacklustre attitude of the management, a huge financial loss has been incurred,” Uttarakhandi said. Wyneberg Allen is the only school, among all major English medium schools of Mussoorie, which has not gone for insurance. “All other English-medium schools of Mussoorie have their school properties insured. My company has insured as many as eight schools,” Anurag Gupta beamed. Gupta said that the cost of insurance is minimal these days. “The annual premium on an insurance for about 1 crore costs Rs 5000 per annum only,” he said. Meanwhile, Uttarakhandi has demanded an independent investigation in the matter and has urged that the erring management should take moral responsibility and resign from their posts. For the first time, 855 women who sat for the examination were mothers, mothers-in-law and daughters-in-law. Belonging to Tharu tribal community, Ganga Devi created quite a stir in her village. No one could understand her sudden interest in acquiring knowledge. Though illiterate, Tharu tribeswomen are known for their courage and resilience. “My neighbours thought I had gone senile but I told them I wanted to study. As there was a chance, I pounced on it. “At least now when I die, I will not be assailed by thoughts of not having tried something that, now, seems so easy,” emphasised Ganga Devi. She went all the way to Tanakpur to take the examination. “My grandchildren could not fathom why so much fuss was being created. But my son and daughter-in-law were particular about my studies,” added Ganga Devi. Her interest in studies was aroused when she attended literacy camps which are part of the literacy campaign organised by Mahila Samakhya for eight months in a year. Encouraged, Ganga Devi has now set high goals for her self. “Now I want to clear my Class X examinations. I know the task is daunting but my hunger for knowledge will take me there,” she added. Ganga is not alone in her quest. Ramwati and her daughter Usha Rana of Sanjana village sat for A-level and Class VII examination. Geeta Devi and her sister-in-law Ritu Kumari appeared for the A-level (Class III) examination. “We conduct literacy camps for women and a bridge course for semi-literates. After these, the women are motivated to go through the entire school syllabus and examinations. The tests are conducted by the Jan Shikshan Sansthan Board, Bhimtal,” said Chanda Joshi, District Project Coordinator, Mahila Samakhya, Udham Singh Nagar. The Jan Shikshan Sansthan creates the curriculum with inputs from state and district-level offices of Mahila Samakhya. “The question paper is of objective type as these women cannot be expected to write essay-type answers. The paper is so designed that it covers the entire syllabus,” said Geeta Gairola, State Project Director, Mahila Samakhya. Middle-order batsman Sabir smashed 22 runs off 24 balls. For Uttarakhand, Ravi Bisht was the most successful bowler picking up four wickets in his three-over spell. Vijay and Khanduri took two wickets each. In reply, Uttarakhand team reached the target in just nine overs with eight wickets in hand. The openers paved the way for Uttarakhand’s victory. Opener Vijay made 13 runs off seven balls while Babu made a quickfire 31 runs off 22 balls smashing four fours. First-down batsman Kiran was the top scorer with 43 runs off 18 balls hitting eight fours and one six in his innings. Opener Sushant was the first to go after having scored four runs. Sandeep was the next to go for 7 runs. Middle-order batsmen Depender and Sachin brought the team back into the game. Depender made 31 runs off 16 balls and Sachin made 36 runs off 20 balls. Ladpur piled up 124 runs. Ravi and Raman took two wickets each. In reply, United XI was all out for 95 runs. Ankur was the top-scorer with 25 runs. Nitesh contributed 23 runs. For Ladpur XI, Sushant, Deepak, Depender and Ajay took two wickets each. In the match played between Graphic XI and Royal Club, Royal Club won the match by 90 runs. Batting first, Royal Club piled up a mammoth total of 179 runs. Middle-order batsman Pankaj was the leading run-getter with 51 runs. Himanshu made 24 runs. Prakash, Sandeep and Dhananjay scalped two wickets. In reply, Graphic XI was all out for 77 runs in 11 overs. Ashu made 24 runs off 18 balls and Ashok made 24 runs off 19 balls. Sushil, Sanjay and Pankaj picked up two wickets each. Top 10 boys and girls in the u-16 category from the country will participate in the camp. Three national-level coaches DK Sen from Almora, Mohan Chandra from Kerala and Mangat Raj from Punjab conduct the camp. President of the Uttarakhand Badminton Association, Ashok Kumar, presided over the meeting today. The meeting was attended by BS Mankoti, secretary of Uttarakhand Badminton Association, coach DK Sen and Nerandra Bhutiyani, secretary of Nainital Badminton Association. Batting first, Baroda Barons posted a huge score of 248 runs for the loss of seven wickets. Their top-scorers were Pradeep (55), Fernandes (42) and Pathan (41). For Kolkata Knights, Sengupta and Mandal took two wickets each. In reply, the Kolkata Knights team was all out for a paltry score of 38 runs in 16.4 overs losing the match by a huge margin of 210 runs. P Sengupta scored 12 runs. Prasad took five wickets and Thakre took two wickets for Baroda Barons. LV Thakre was declared the Man of the Match.